Chennai: Great Lakes Institute of Management hosted the 10th International Entrepreneurship Conference (IEC) at its campus yesterday. Organized by the Centre for Innovation and Entrepreneurship (CIE) committee, the conference saw Mr. N.T. Arun Kumar, Special Representative – IT & Innovation and Director General (designate) of International Institute of Digital Technologies, Government of Andhra Pradesh as the Chief Guest. Guest of honor Mr. Matt Murphy, CTO, Thinkspan, Chicago, USA joined the conference on a video call. Other guest speakers included Mr. Sanjeev Narsipur, Managing Director- Technology Consulting, SI Practitioners & Blockchain, Accenture and Mr. Sudin Baraokar, Head of Innovation, State Bank of India. This year, the conference was hosted on the theme ‘Blockchain beyond Bitcoins – An exploration of Profundity’. 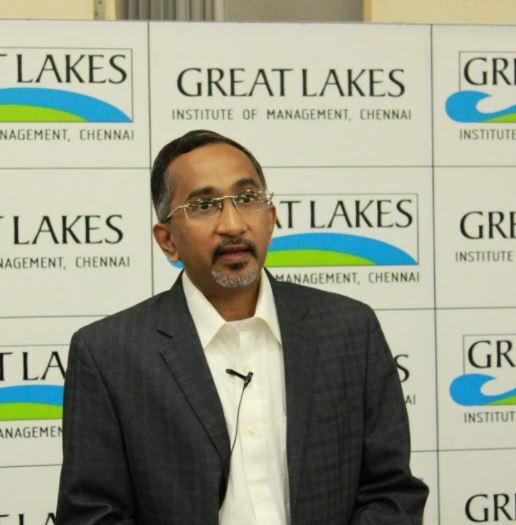 Setting the tone for the conference, Dr. Bala V Balachandran, Founder, Dean & Chairman of Great Lakes Institute of Management while addressing the gathering through a video call said, “There are many developments taking place in the block chain space and is expected to transcend in future, it is about time we understand how much impact it will have in businesses.” We have centered this year’s conference around this theme so that the entrepreneurial opportunities in this space can be explored better, he added. Talking about how Blockchain will transform businesses in the years to come, Mr. N.T. Arun Kumar, Special Representative – IT & Innovation and Director General (designate) of International Institute of Digital Technologies, Government of Andhra Pradesh said, “Be it public or private sector, Blockchain will help recognize contributions and also balance withdrawals in a transaction. One of the biggest use of Bitcoin is that it is a great way to bootstrap currency.” It is a technology of trust. A technology that replaces the guarantor in an incorruptible, and immutable way with guaranteed efficiency, he added. Taking the audience through a special presentation on ‘The principals of Blockchain system design’, Mr. Matt Murphy, CTO, Thinkspan, Chicago, USA, explained how to develop a deep understanding of blockchain systems in an entrepreneurial perspective. Mr. Murphy also added that though a lot of discussion is happening in this space, it is still in the bootstrapping process. “Blockchain and Cryptocurrency are still in their infancy”, he said. Mr. Sanjeev Narsipur, Managing Director- Technology Consulting, SI Practitioners & Blockchain, Accenture and Mr. Sudin Baraokar, Head of Innovation, State Bank of India spoke jointly on how Blockchain is evolving in financial services, Banking, IT and Supply Chain domains. “Bitcoin is going to have a huge impact on the current financial system. Not just that, few years down the line, it is likely to become more disruptive and will offer enormous potential for next level of automation, integration and service availability across many different verticals bringing in speed, efficiency and transparency. This will in turn disrupt financial services, supply chain and many more industries in long run”, Mr. Sanjeev commented. Adding to the above comment, Mr. Sudin Baraokar, said, “Banks like SBI have adopted blockchain technology and have been experiencing fundamental changes in terms of the nature of money, the way the society interacts and how the markets operate.” As we progress, the future is more likely to be free of frauds, risks and hacks, he stated. The inaugural session was followed by a Panel discussion on the central theme of the conference. The panel discussion, moderated by Dr. K.C. John, included the following speakers: Mr. Babu Munagala, Founder & CEO Zebi- Blockchain application in Andhra Pradesh for land records, Mr. Vikram Subburaj, Founder & CEO, GIOTTUS Disruptive Inter-Cryptocurrency Exchange, Mr. Sanachit Mehra, Founder – Cateina Technologies, Blockchain solutions with Yes Bank, Pharmaceutical, Automotive Logistics, Mr. Samrat Kishor, Manager- Accenture and Mr. Ish Goel, Founder – Founder Gov Blocks & CEO, SOMISH. Leading to the conference, the CIE had conducted various B-plan contests to encourage aspiring entrepreneurs at Great Lakes. At the end of the conference, the winners of these competition were awarded with cash prizes and mementos. The conference also witnessed the honoring of family members of (Late) Shri. Narasinga Rao, an alumnus of Great Lakes and Co-founder of SSI Ltd. Narasinga Rao was instrumental in taking SSI from a start-up to being ranked top 500 companies in India by Dun and Bradstreet.